Put your photos in an album with a Mickey Mouse and Friends twist! 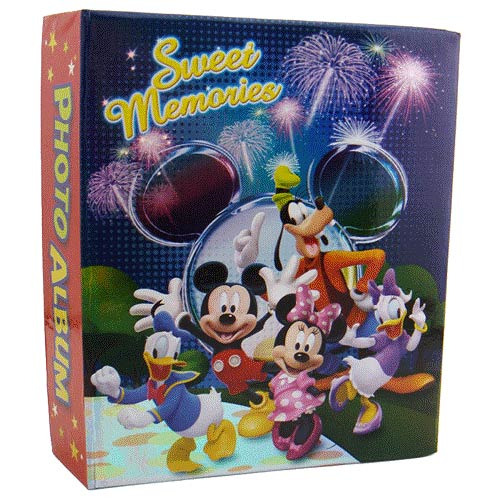 This Mickey Mouse and Friends Sweet Memories Medium Photo Album features the iconic Mickey Mouse ears symbol with Mickey dancing in front of it with four of his Disney pals, including Goofy, Donald Duck, Daisy Duck, and Minnie Mouse. Measuring 8 3/4-inches tall x 7 1/4-inches wide, this photo album is a great keepsake for your timeless photos and has the words on it, "Sweet Memories." Holds up to 200 "4-inch x 6-inch" photos!